Palliative care was recognized in Moldova as part of the health system in 2008. In Transnistria, palliative care services have not been introduced, this field is a novelty for both medical staff and patients in the region. According to the statistics, in 2016 in Transnistria 1855 people were diagnosed with cancer – that are 212 cases more than in 2015. At the end of 2016, 10,012 people, which are 2.1% of the population of the region, were registered with the Dispensary oncologist from Tiraspol. In 2016, the amount of people who died in the first year of diagnosis was 27.6%, all of them would have needed palliative care. In order to solve this problem it is necessary to provide the oncologists, therapists, decision-makers from Transnistria the documents regulating the palliative care system in the Republic of Moldova (primarily the national clinical protocols in palliative care), translated in Russian. Beyond the lack of the legislative framework regulating the field, another identified problem is the lack of trained staff to provide palliative care services throughout the territory of the Nistru River. The main purpose of this project is to provide the necessary assistance for the initiation of a functional system of palliative care in the Transnistrian region. 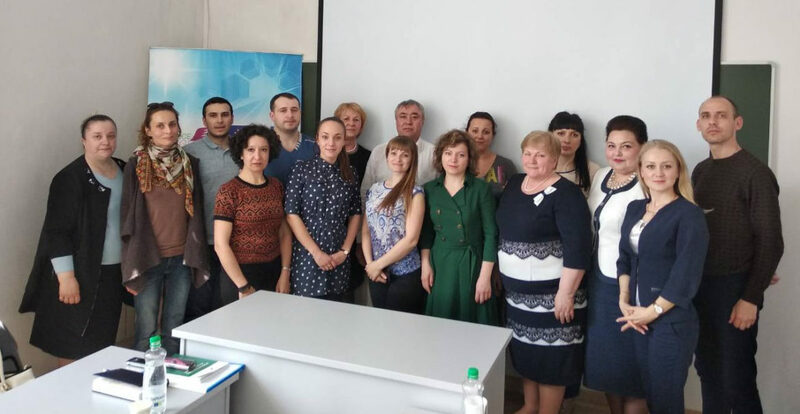 Training of 15 specialists in palliative care at the Tiraspol Oncology Dispensary for 2 weeks (80 academic hours) carried out by Chisinau trainers from FFMS Angelus Moldova” in April 2018. Translation of protocols and specialized information (leaflets, information, palliative care guide, ministerial orders and 5 clinical protocols for palliative care approved by the Ministry of Health in 2011), to be printed and distributed. A two-day study visit, in which Transnistrian training participants will come to Chisinau for home visits (in June), together with the Hospice Angelus staff. On the second day, the participants will visit the Casa Angelus Center for Pediatric Palliative Care (Isacova, Orhei rayon) in order to observe in practice how pediatric palliative care services are provided in a stationary setting. an informative broadcast on the Transnistrian regional television dedicated to palliative care and its importance, with the invitation of specialists in the field trained during the training. The broadcast will inform citizens about the opportunity to receive palliative care. The programm will raise awareness in Transnistria of the importance and significance of palliative care in contemporary society. Following the implementation of this project, we are counting on the introduction of a functional system of palliative care in the Transnistrian region. In the first stage, after the possibilities of establishing a stationary hospice, trained staff and a local policy will be identified, the first mobile teams to provide palliative care offered at home will be able to provide help to patients in the region. Once this system has been introduced, it can be taken over and monitored by local government organs and long-term healthcare institutions in the region. Through cooperation, the inhabitants of both banks of the Dniester River can improve their living conditions. Str. ALEXANDRU CEL BUN 40/1, MD2012, CHIȘINĂU. © Copyright 2019 - Hospice Angelus, Inc. All rights reserved.